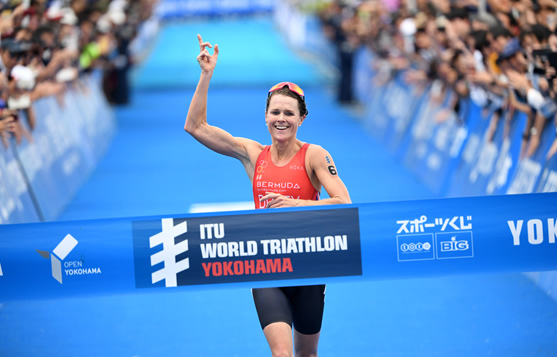 Collecting the first win in the official Tokyo 2020 Olympic qualifying period, Flora Duffy (BER) became victorious at the 2018 ITU World Triathlon Yokohama. Winning for the second straight year, the gold also claimed Duffy her second straight WTS victory of the 2018 WTS season after she won in Bermuda just a few weeks before. “Coming after such a high in April from the Commonwealth Games and Bermuda it was definitely a stretch to get here. I am very happy with my race, I often don’t get enough credit for my running, I came off the bike with a group of really strong runners,” Duffy said of her win. Duffy continued her streak of strong race consistency from start to finish after she led out of the swim, remained in the lead bike pack and then stole the race away in her run, which ultimately landed her at the top of the Series leaderboard in the WTS rankings. “That is very cool, I was not expecting that today that was not the goal. It was just to get a good score and set myself up for the Series, but if I am top then I can’t complain,” Duffy added after finding out her Yokohama win brought her to the top of the Series. Claiming the silver medal was USA’s Katie Zaferes who also collected her second-straight WTS podium of the season. Then finishing off with the bronze was Non Stanford (GBR) whose third place landed her on her first WTS podium since 2016. The Yokohama race was the opening race to begin the two-year Olympic qualification period. Just a slight chop in the water welcomed the women as their dive officially kicked off the road to the Tokyo 2020 Olympic Games. Two 750-metre laps awaited in the second standard-distance race of the season. USA’s Summer Cook pushed ahead in the first lap, getting the time stamp before the second dive. However, Duffy was right on her heels and in the second lap she overtook the leader position and exited the waters first into transition for the second time in her career. The first lap on the bike looked like Duffy and Zaferes might keep a successful breakaway as they were swift through the transition and created a gap. But after the first of nine laps on the bike, with the push of Great Britain’s Jodie Stimpson, a pack of nine women joined the front duo. After an early bike crash that dropped two women, the leading group then tallied nine strong, which included Duffy, Zaferes, Stanford, Stimpson, Laura Lindemann (GER), Natalie Van Coevorden (AUS), Gillian Backhouse (AUS), Emma Jeffcoat (AUS) and Therese Feuersinger (AUT). While some strong names remained in the main chase pack, such as Aussies Ashleigh Gentle and Charlotte McShane, they never could get the edge to close the gap as it remained about a minute apart throughout the bike. Despite a few attacks from Duffy near the final laps on the bike, no other breakaways stuck and the leading nine rode into the second transition together with the gap to the chase at 1:14. Seeing who would take control of fresh legs after a tough bike, Stimpson and Duffy were the first out of the transition gate followed by Zaferes. Then Duffy and Zaferes overtook Stimpson and once again became side-by-side out front in the race. Duffy wasted no time however and showcased that she has also become one of the top runners in the field. She blasted away from Zaferes in the first lap and never looked back. She held onto her lead and was never threatened, leaving her to enter the finish chute and take control of a Yokohama victory for the second year in a row, but this year capturing the fastest run split of the day at 33:26. Zaferes stayed strong in the silver position and never faltered, entering 33 second behind Duffy to improve from her Bermuda bronze in April. It was the impressive run by Stanford that got her the bronze medal. She bypassed Stimpson and took control on the 10-kilometre course to hold tight to the final podium position, something she hasn’t achieved since WTS Cape Town in 2016 after two hard years of injuries. 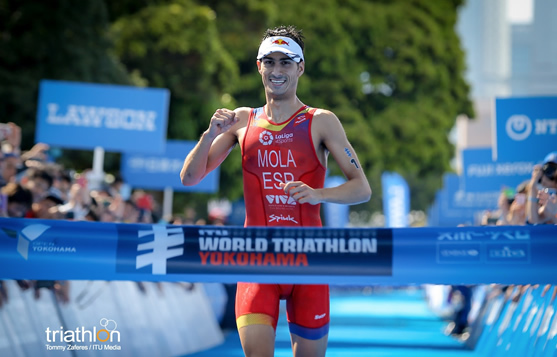 Another performance for the history books as Spaniard Mario Mola delivered a three-peat victory at the 2018 ITU World Triathlon Yokohama. After putting up one of his best swims of his career, surviving a massive bike pack and then breaking away in a dominating run, Mola became the first man in WTS history to ever win in Yokohama for three consecutive years. The Yokohama win also was his first WTS gold of the 2018 season, which meant that he will remain as the current frontrunner in the Series rankings. “I am really happy. Obviously, it hasn’t been the easiest three weeks. Seeing Carol (Routier) fighting after the accident, it was unbelievable. Everyone around me was making me feel very strong in order to be close to her, so this obviously goes to Carol,” said Mola speaking of his girlfriend who was involved in bike accident after being hit by a car. The silver and bronze medal went to two men eager to get back on the WTS podium. Aussie Jacob Birtwhistle outsprinted Spaniard Fernando Alarza in the final moments to finish second, his first WTS podium since July 2017. The bronze for Alarza was also his first since June of 2017. The men lined up directly following the women’s race, which officially signaled the beginning of the fight for qualifying points for the Tokyo 2020 Olympic Games. Diving into the water, Richard Varga (SVK) returned to his form and led through the full 1500 metres. He exited the swim in the lead for the 24th time in his career. However, Varga was anything but alone as nearly the entire field climbed the ramp out of the water together and into the transition zone. After a busy hustle and bustle to get through to start the bike, a large group formed. While the beginning of the 40-kilometre, nine-lap bike course saw a 40 plus group ride side by side, it seemed inevitable that breakaways were soon to follow. But nothing ever came. A train tallying nearly 44 men snaked through the course without any change lap after lap. All the big names intertwined through the pack, including Mola, Alarza, Birtwhistle, Richard Murray (RSA), Henri Schoeman (RSA), Kristian Blummenfelt (NOR) and Vincent Luis (FRA). The chase group contained some hopefuls that could not get their swim in order to make the main group, such as Mexico’s Crisanto Grajales and the WTS Bermuda bronze medallist Gustav Iden (NOR). The full huge pack entered T2 together, making it as busy as the first one and meaning the gold would be determined on the run. Despite riding among the masses for the full bike leg, Mola wasted not a single second getting his feet into his shoes and onto the pavement to find his moment. He pushed past the herd and went straight to the top to get away. He kept increasing his lead with every stride, pacing to not get any contenders threatening his three-peat gold. No threat ever came and Mola continued to get further away until his lead was over 30 seconds from any type of chase. He breezed into the finish chute to collet his 12th career WTS win and first of the 2018 season. The battle then was on for second and third. Birtwhistle and Alarza capitalized on their fresher legs and pulled ahead. While Alarza held a slight advantage over the Aussie for the majority of the 10k, Birtwhistle made his move in the final kilometre to steal the silver, leaving Alarza to finish the podium with third. “I am really happy to come back to the podium. I had some difficult months. In the winter it was difficult to get some good moments when your head is bad, but I am really happy with the last month and to get back on the podium,” Alarza said. Another huge performance of the day came from Canada’s Tyler Mislawchuk, who finished a career high of 4th place after surviving a tight pack in the run.